Western Harmonics Fan #1825-AG 12 Volt Dc Solar and Battery Powered Green House Exhaust Fan. 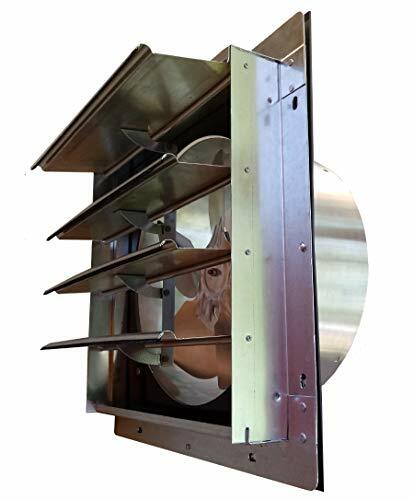 This fan features a 12 inch fan size with wind operated louvers running on solar and battery. Includes: Fan and solar charge controller. The fan is thermostat / servo operation compatible. The fan comes outfitted with plug and play 2.1 x 5.5 dc connectors cord. Features: Aluminium housing and big air movement of approximately 1000-1500 cfm. Specifications: DC Shutter Fan Rough Opening Req: 14.25 inches wide; 14.25 inches tall. Overall Size: 17 inches wide; 17 inches tall Fan Size: 12 Inches CFM: 1000-1500 Electrical: DC 12 Volts; 20 Watts; 1.1 amp operating Fan type: Brushless; DC Plug type: 2.1 x 5.5mm plug and play cord. If you have any questions about this product by Western Harmonics, contact us by completing and submitting the form below. If you are looking for a specif part number, please include it with your message.